I am a stay at home mother. It's who I am, not just what I do everyday. It's the identity at the absolute core of me. My children are the reasons I get out of bed every morning, and also why I don't get much sleep at night (I'm still nursing). I absolutely love being a mother, but I'd be lying if I said it was always easy. From the time I open my eyes until the time I lay down, there is always something or someone that needs my attention. This is especially true because my youngest is a year old and that's a very needy stage. My little one is never far from me. Aside from the constant nursing breaks throughout the day, there's the silly songs, dances, and playtime. There's picking up the same toys over and over again because she throws them right back on the floor as soon as the last one is put where it belongs. There's refolding laundry because she yanked the clean piles down before I could put it all away. There's washing dishes with her hanging onto my legs screaming for attention. There's using the bathroom with her on my lap because she's found her way in and will unravel all the toilet paper if I set her down. One of the biggest struggles my husband and I have encountered because of the decision to keep me home with the kids is finances. It is extremely hard to survive on one income when you have 6 kids. At the end of one very stressed out day, where my daughter had been exceptionally fussy and I felt like I hadn't gotten much of anything done, one well meaning friend said "have you thought about going back to work". My response came out of my mouth before my brain had the chance to stop it; "go to work, I can't even go to the kitchen for goodness sake". No, absolutely not. The answer does not require me to leave my baby. There's no way I can accept that solution. The answer we needed did come though. Yes I did need to work, but I was presented with the opportunity to work from home. I became an entrepreneur. I have this new business and I'm pumped. Here's our ticket to financial freedom. I'm ready to rock, we are gonna crush it. I started out strong, but then the baby started teething. We weren't sleeping at night so my productivity faltered. I couldn't make phone calls because she would fuss every single time I picked up the phone. I used Naptime like I always had, to get my house work done, and she made it impossible for me to work while she was awake. The one thing I was able to participate in was the live broadcast. I could hook it up to the speaker and listen while I took care of my home and baby. The message I kept hearing, from actually a few different sources was "don't let your reason for doing this to become the reason you can't do it". Logically I get it, I truly do. My kids are the reasons I want to push so hard to become successful. I want to give them the best life possible. They are also the reason I can't get anything done or anywhere in my business, right? I actually got angry for a time. Every live I heard was hosted by a male. They just didn't get it. Of course they can tune it all out, their wife is in the other room taking care of the kids so they can take care of the business. It took awhile for me to see this struggle clearly. I was making excuses. I was using every thing I could think of to explain why I couldn't, instead of why I can. Honestly, how do I know what goes on in anyone else's house? I don't. I do however know what is going on in my house and when I stop and think about solutions instead of excuses, the answers always become crystal clear. Why does the baby hang onto my legs screaming while I do dishes? It's the same reason she wails at the top of her lungs when I try to make phone calls. Attention. She craves my attention. She needs it. It's both comforting to her and how she learns about the world around her. Bingo. The light bulb goes off in my head. I'm doing this to create a better life for my children. What better way to ensure their success than to teach them how to create it. So instead of trying to separate work and being a mother, I need to combine the two halves. So my days have changed a little. Yes we still have playtime and naptime. But instead of putting on a movie to try to take her attention off of me while I work, I gather my tiny entrepreneur into my lap. She gets her own notebook and pen. And we work together thru the afternoon. She has a toy phone she uses when Mommy is making phone calls. My housework still gets done with her running around destroying my progress, but I've accepted that. For some reason this particular child insists on showing me the beauty of choas. Yes there are still moments that I call Mommy emergencies. Those times when I truly do have to put my work down and take care of something. My attitude about them has changed tho. I no longer say "I'll get back to it later." Later is a time that doesn't exist therefore it never comes. Instead I tell myself "I'll go back to this at 6 or after kids go to bed, after I change the diaper". The point is I give myself a definitive time to return to the task. Since changing my mindset, my productivity has skyrocketed. I no longer fill myself with excuses or false promises. And I have been rewarded. I love knowing that I'm giving my little ones an example that will take them far in life. And busy afternoons curled up in our chair together working, is such a comforting experience that I know will be one of my most treasured memories. ​Katie Kephart is a wife, mother of 6, author, and a work from home entrepreneur. She's survived many major challenges in her life and has overcome great things. She is now committing herself to sharing her story and lessons with the world and we feel blessed and priviledged to have her as a valued author within our midst. It’s close to 3 am and I’m exhausted. All of my work for the day has long since been completed. The children went to school today and were welcomed home with open arms. Dinner and “how was your day” discussions were so many hours ago, it feels almost like yesterday. Good night hugs and kisses have long since passed. My husband and I were ready to relax, spend a few hours pondering the universe (yes we actually do that on a consistent basis) and eventually curl up to sleep. Our youngest child, barely more than a year old, had other plans. In the beginning, it wasn’t a big deal. Eventually tho we truly did become tired. We tried rocking her, but she turned into this mythological banshee, screaming at the top of her lungs. Nursing would solve the problem for a few minutes but the second I unlatched her, her little eyes would pop right open and she was good to go for another round of play. We tried, tho somewhat silly, explaining that mommy and daddy are tired and it’s time to rest. Obviously rationalizing with our infant failed. As the clock ticked away and our eyelids became heavy, our patience wore thin. We are tired, the big kids will be up soon, “you go to bed, I got this”. ​We started worrying about tomorrow and making it through the next day without the rest we need. We started complaining about how awful it is that she isn’t asleep yet. Which of course made the situation worse. Again we tried to get our little ball of mischief to lay down. Instead she started jumping on our bed and waving to herself in the mirror. She was so cute and we laughed for a second. This is the point where our minds started to shift. We started talking about how little she used to be. Sweet little memories of the tiny human we brought into the world. We looked at how much bigger she is now and remembered, it won’t be this way forever. Instead of complaining, we decided to embrace the moment at hand because when it’s gone we will miss it. We got outta bed, again. This time we made cups of chamomile tea, and indulged in our daughters laughter. Wouldn’t you know that within the next half hour we accomplished what we had been fighting for all night, our angel drifted off to dreamland. When we completely surrendered to the moment in front of us, without complaint, the results we were striving for manifested almost immediately. That’s true of any trial in life, resistance makes you weary. Fighting against anything only leads to more aggravation. How many times have you said to yourself “I keep trying but it just isn’t working”. Are there days where you just feel like you fought tooth and nail, to accomplish nothing and felt completely burnt out at the end of it. I know I’ve had plenty of those times. But in the wee hours of the morning, I was truly taught the power of surrendering. When you fully embrace what is before you, you are ready to receive what you are asking for. Katie Kephart is a wife, mother of 6, author, and a work from home entrepreneur. She's survived many major challenges in her life and has overcome great things. She is now committing herself to sharing her story and lessons with the world and we feel blessed and priviledged to have her as a valued author within our midst. When you acknowledge your lack of knowledge before asking for answers, you will become a receptor of great wisdom. We all experience that nagging voice inside our heads that fill us with negative thoughts and feelings. What if this voice was a physical person, would you entertain their opinion by letting them influence you or would you tell them to back off and be quiet? Personally, I have a low tolerance for negative people. I do my best to associate myself with people that are uplifting and inspiring. I associate with people who will support me in my personal greatness and who I can support in theirs. We’ll call this negative voice Chip. From now on, when you hear that voice telling you how worthless you are and that you aren’t good enough to do something, picture him as a person completely separate from you. He’s the Chip on your shoulder. Chip’s job is to keep you small and playing the game of life at a lower level. He wants to keep you from getting out of your comfort zone and he'll convince you that he's doing it to keep you safe. He encourages the emotions of fear, sadness, and anger. Chip is most present when you are stressed or upset. He will fill your head with all sorts of thoughts that seem logical for the moment, until you break loose and realize it was all a bunch of deception. Chip’s worst enemy is your intuition. Your intuition is your wise spiritual companion. She is never wrong and will lead you to all things that will bring you peace and happiness. We’ll call her wisdom. Wisdom is always there, but unlike Chip’s loud obnoxious voice, she speaks softly. She will encourage you to move out of your comfort zone and into a higher playing field. She is the guiding wisdom of your soul. With her help, you will be in an ever progressing state. She will help you to reach your greatness. We live in a fast-paced world with so much noise. If we do not take time for ourselves in a quiet environment, we may not hear her voice when she speaks. Once a day at the least, you should take a moment to pray and seek the guidance of this spiritual companion. It is through prayer that we can communicate with this heavenly messenger. You may ask questions, share your fears and worries, your successes and anything else that will help you gain a greater understanding of your current or past situations. The key to unlocking wisdom is through humble prayer and the willingness to act on the answers you receive. Humility is a special ingredient that will unlock wisdom that you never thought was there. All of the answers you seek are already available but unless you are in tune with this spiritual companion, you will never unlock it. I like to define humility as spiritual power. It’s in knowing that you don’t know that answers will appear. When a person believes they know everything, they are not receptive to new knowledge and wisdom – because they “know everything”. When you acknowledge your lack of knowledge before asking for answers, you will become a receptor of great wisdom. Be careful as you interact with Chip. The more you entertain his lies and deception, the stronger he will be and the more he will show up. You need to make a resolve today that he is no longer welcomed in your house (mind). The same is true with regards to wisdom. The more you heed (take) her counsel, the stronger she will get and the more she will feel welcomed to show up when you need her most. Another aspect that is crucial to be receptive to this spiritual companion is to live worthy of her companionship. To be worthy, the single most crucial characteristic is love - true love, unconditional. The more you live in this love (according to your knowledge and understanding), the more present she can be in your life. This component is crucial if you want her to stay strong in your life. Chip is the enemy to your success, happiness and greatness. He wants to keep you small, unworthy, fearful, angry, and/or sad. Wisdom (your intuition) is there as your gentle, spiritual companion to guide you on your path to true joy and greatness. She is never wrong and will inspire you to take positive action. She will encourage you to get out of your comfort zone and forever growing and becoming more. The more you entertain the one, the stronger they get. The more you ignore or forcefully reject the one, the weaker they get. Your job now is to do all you can to heed your spiritual guide and reject Chip at all costs. Now that you have a general understanding of the influences you will deal with on a personal internal level, you will be better equipped to deal with that inner voice that's been holding you back. Like this? Than you'll love our Goal-Getter community and high impact mindset training! Click on "JOIN FREE NOW" below to join our community! What's The Worst That Can Happen?... Is This The Right Question? I was reading an article today by a very influential blogger and I feel that an important principle was taught in the wrong way. She was teaching her followers to use a simple sentence to overcome fear, in making critical decisions. When you're faced with an alternate path or opportunity and you're perplexed about whether to take a new course or stay where you are, just ask yourself this question: "What's the worst that can happen if I do" and "what's the worst that can happen if I don't". Turning every experience into a negative is not the best way to approach life and potential opportunities. By asking "what's the worst that can happen?" on both sides of the equation, we're turning both sides into a negative with the intention to choose the better negative. Why turn every opportunity into a negative? How can that ever be enjoyable? Wouldn't this cause you to expect the worst of both sides? What if we truly understood growth and failure and embraced it as a bare necessity for success? What if failure was only feedback? What if every time we try something and it doesn't go the way we imagined it, we think to ourselves "Well... that didn't go the way I planned it but here's what I learned". Then take that single lesson and bring it into your next attempt. If you've gained one single insight from the experience that you didn't have prior to that experience, you've gain a treasure that can never be taken from you. If we repeat this process enough, we will have it mastered and reach our desired outcome or better over time! This is actually how I approach books as well. If I read an entire book and get even one principle I can apply in my life, it was worth the time and effort. When we understand that failure is simply a method of correcting our course until we've arrived, we can be better prepared to face it with confidence and power. Failure is not a bad thing at all! It's actually a good thing! It's a perfect system of correction that will lead us right into our desired outcome and in the process, mold us into more powerful and able beings. This perfect system of correction has been defiled by media and the systems of government. We have been taught from a very young age that failure is bad and must be avoided. In my experience, failure has been my best ultimate teacher and as I've made a conscious decision to embrace it as the perfect system that it is, I've been able to accomplish things I never thought possible. With this mentality, I've literally gone from a high school dropout gang member, living in the projects with a single mom on welfare, to living my childhood dream! With this new mentality, there is nothing that can hold you back! So next time you're faced with an opportunity, don't ask yourself "what's the worst that can happen?". Instead ask: "What would the learning experience be like and how will it benefit me?" Do Other'People's Doubt Hold You Back? Do other people's doubt in you hold you back from taking action? Have you given up on your goals because someone has told you you can't or shouldn't do it? I'm going to tell you a little story and I hope it helps put perspective on the situation you've had to face. One day on a farm in a beautiful little village, there was a group of donkeys in a small field. The farmer was away for a small business trip and one of the donkeys managed to venture off on the village streets. After some time roaming the streets, the donkey came to the village well and decided to peak in. No sooner had he done so and down he went to the bottom of the well. Finding himself in a serious dilemma, he began to panic and cry profusely! The local farmers and citizens heard the horrible cries and all gathered around the well, where a lowly donkey lie in distress. They asked themselves: "What can be done?" Recommendations were made but to no avail. They were not equipped with the necessary tools and resources to get the job done. So when all options were exhausted, they concluded that the best thing to do is to put the donkey out of its misery, by simply burying it alive in the well. So everyone went to their homes and picked up their shovels, with the sole determination to bury the donkey alive assuming this was in the donkey's best interest. Note: I want you to understand that these villagers truly believed that what they were doing was in the donkeys best interest, according to their limited knowledge and resources. So one by one they started to shovel in the dirt. As the dirt hit the donkey, he shook it off and took a step up. Once again the dirt came and once again he shook it off and took a step up. After doing this for about 20 minutes, the donkey realized that his freedom was near, because the more dirt came in, the higher he went! Imagine how shocked they were, when the donkey casually walked out of the well - accomplishing what they considered an impossible goal! He was literally using their doubt and lack of resources to reach his goal! So when you have loved ones who are telling you it can't be done and that they're just doing what's best for you, use their doubt as a way to fuel you positively by just shaking it off and taking a step up. Every time they doubt you, they are figuratively shoveling in more dirt. Just shake it off and step up, shake it off and step up. As you do this consistently you will, over time, casually walk out of the well and imagine how shocked they will be when you've done what they considered an impossible goal! The donkey could have just sat there and gave up on his goal. He could have bought in to their doubt and settled for being buried alive but instead he chose to shake it off and take a step up. What will you choose to do? The choice is yours but I recommend you go for it at all cost! Just know that their intentions are good, according to their limited knowledge and resources, but that you don't have to buy into it! You need to just shake it off and step up every single time. If you found value in this article and would like to have access to training and resources like this on a regular basis, simply get back with the person who shared this with you and ask them how you can get more. And as always, remember to live life with passion, purpose, and fulfillment everyday because life is too short to have it any other way! I have a secret strategy that I use, on almost a daily basis, that literally allows me to personally grow close to 100 times faster than most of my peers. This secret has provided me with an edge on all of my competitor and increased my value in the market place at an alarming rate. Would you like to know my little secret? Most people avoid challenges like a plague and when the challenges do come, they typically complain and do all they can to run from it. I do the exact opposite! I don't run from, complain about, or avoid challenges. Instead, I create them! Oh yeah, you heard me right, I CREATE THEM! Now why in the world would you do THAT Coach Luc? When you understand exactly what challenges provide and how many benefits come from them, you would do the same. Every single thing you want to accomplish in life has a set of challenges associated with them. Even when you live without any real goals, there is a plan in play at all times for your life and you are required to follow that plan in one way or another. This plan, if not followed, will have to be persuaded and pushed with challenges (lessons) until you are back on the path. The longer it takes for you to learn the lesson, the longer you will experience the challenge. If you want to stop the challenge, you must simply learn the lesson and then life goes on with relative ease, with a steady and consistent flow. If you're experiencing challenges in your life, you must simply ask: "What am I to learn from this?" and then spend your time finding the answer. If you don't find the answer, you can't learn the lesson and the challenge continues. Now... here's what I've learned. The only and I literally mean the ONLY way to grow as an individual or as a group, is through challenges. There are no lessons in ease and there is no growth in comfort. So, I can do like everyone else and wait for challenges to come by complete chance and grow at a slow and unpredictable pace or... I can speed up the entire process by challenging myself day after day after day. Instead of growing an inch, I can grow 100 inches! This is self growth on steroids! If you want to take complete control of your life, you need to control your very challenges. Once YOU are in control of your challenges, you can boost your productivity and potential by 100x. You only have one life to live and if you wait for challenges to come your way or worst, you avoid them all together, you are very limited as to who you can become and what you can accomplish. But if you take it into your own hands and fast forward your growth and development 100x, simply by creating your own challenges everyday, your personal potential is limitless. Want a second, more motivational reason? By creating your own challenges, you will be stronger and more capable of facing the unexpected challenges that may come your way. Start now to find little ways to challenge yourself and don't back down. Take control of your life by taking control of your challenges and you will have power that is unattainable otherwise. Did you like this article? Go ahead and get back with the person who shared this with you and ask how you can get more training like this on a consistent basis. If you're ready for change, we're ready to support you. Are You Pursuing Accomplishment or Destiny? Both are good but one is greater! An accomplishment goal is something you set for yourself just to get it done and feel a sense of accomplishment. These goals usually have no deep impact on anyone else but the individual and sometimes not even the individual. An accomplishment goal can basically be anything you would do that only impacts your own life or gives you a momentary sense of self worth. Let me repeat that... "An Accomplishment Goal Has To Be Set Over And Over Again To Get That Quick Fix Of Self Worth"
Destiny goals follow a virtually steady course that lasts an entire lifetime. It may even be felt long after you're gone - leaving a legacy that impacts the world through decades and maybe even centuries. It's your reason for being! A true destiny goal will empower the individual to leave his/her mark on the world. It will drive the individual to want to make the world a better place. Everyone of us has a destiny goal - a specific reason for being here but most have never even thought of exploring what that is and as a result, their destiny goes unfulfilled. Many people die, without ever knowing for sure why they ever lived. If you are jumping from accomplishment to accomplishment just for the sake of accomplishment, you're life will never truly take on meaning. You will always have to look for the next fix to satisfy your thirst for self-worth. Why not discover what you are truly here for - your reason for living - and simply commit your entire life to living out that purpose? In this way, you will not be swayed by the next shiny object that promises you a feeling of accomplishment but instead, leave your mark on the world by following one straight course, never needing to second guess yourself! When you commit to a destiny goal, you will be guided internally by your spirit and you will be able to trust your gut feelings on a much deeper scale. God has set a course for you to follow and the goal now is simply to align yourself with that course. When you do, you will discover a strength and power that will surpass your understanding. There will literally be nothing that can stop you from living in your true potential and you will go on to impact hundreds, thousands and maybe even millions of lives. This is your potential when you embrace your destiny and the result will be a legacy that lives on long after you're gone. Distractions!!! Gosh how I hate distractions! You've finally made a commitment to get the work done, you've organized your desk, made your favorite hot drink, made sure to get your TV urge out of the way, fed your pet, called a friend to tell them about the new project you're working on, went to the bathroom to avoid any unnecessary distractions and FINALLY you sit down to get the work done... but the phone rings and instead of letting it go to voicemail, you take the opportunity to keep procrastinating and answer the phone. 30 minutes goes by and you finally hang up the phone and "oh crap, it's getting late, I better start working on this tomorrow". Has this ever happened to you or am I just crazy? It wasn't until I decided to make a conscious choice to limit all distractions that I started to excel in my life and especially in my business. Distractions can be everywhere! The key to limiting distractions is to first, realize it's a problem second, make a conscious decision to limit them and third, make a commitment to stop making excuses. The only reason we even have distractions is because, at either a conscious or subconscious level, we don't actually want to do the work. If you were passionate about what you do and had made a firm commitment to accomplish your goal at all cost, you wouldn't allow distractions to get in your way. Often times we struggle with something simply because we have yet to acknowledge that we have a problem. Until we realize we have a problem, it can't be fixed. Personally, I made a commitment to examine my habits on a daily basis. Everytime I get a good result, I say "This was good and I will keep doing it but is there a way that it could have been even better?". In this way I am not limiting my life's experience to just good things but am also allowing myself to think broader, so that I'm not closed off to bigger and better things. I will keep doing the "good" thing until I find a "better" thing. As you examine your every move and ask these simple questions, you will, over time, create the exact life you desire by altering your course as many times as you need to, in order to get the exact results you want or better. The only way to start limiting distractions is to, once and for all, make a choice that you will not allow it. It's not possible to eliminate all distractions! You'd have to literally remove your brain for that to happen...lol But you can limit them immensely. Before you even decide to start working on your goal, whatever that may be, you will need to examine your environment and ask yourself "What could be a potential distraction?". Then, start eliminating as many of them as possible. Create your Power Space! This is a place you can go to and know for a certainty that nothing will get in your way. You'll also want to create an environment that, not only limits distraction but, enhances your creativity. Simply put things within your Power Space that puts you in a good mood, helps you to feel energized, and brings clarity to your mind. I always say "If you're looking for an excuse, you'll always find one". It's important to understand that every distraction you deal with is virtually an internal or subconscious excuse for not getting to work - doing what you know will get you the results you're looking for. Once you realize this, you can then be in a position to eliminate them. Let's say you're about to do your work or you're doing your work and something is drawing your attention. If you don't see this as an excuse, you'll more than likely drift off and go entertain that distraction. But if you see this as an actual excuse for not doing the work, you can consciously say "Nope! I'm not gonna do that. I'm done making excuses. I have a dream and excuses won't get me there". See, right now you see distractions as a "more important, funner, or more pleasant thing to do". So it's virtually a positive thing, at least subconsciously, to follow the distraction. But as soon as you see it as an excuse and you know that excuses are the enemy of your dream, distractions are now the enemy. And what do we do when we encounter an enemy? We either run from it or fight it dead on!!! Either way, we are not enjoying it and we are not supporting it. If you are not committed to your goal with intensity and focus, you may want to either re-examine your goal or re-examine your why. (See Also: The Power of Why). If what you are doing doesn't come to you with passion, purpose and fulfillment everyday, you may want to reconsider what you're doing or why you're doing it. We often spend our time on things simply because this is what we believe society wants us to do and in order to fit in, not cause drama, please our friends and family etc, we simply settle for the life we have without any clear vision as to what we want for our lives. So the questions to ask are: "What do I really want to do with my life? What do I want to be remembered for? And will it all matter in the end?" Answer these three questions and I believe it won't be long before you're directing a more passionate, purposeful, and fulfilling life. The point here is to focus on the POSITIVES of your life and try to find true, fulfilling meaning in your life so that you can live life with passion, purpose and fulfillment every day! Will it all matter in the end? Once you get clear on these three questions and have made the commitment to move forward with limited distractions, you will be on a path of true purpose and excellence in your life. You've heard of preventive health care right? The basis is basically this: fuel your body with what it needs to be strong and healthy to prevent disease, instead of looking for a cure and treating it when it comes. Would you agree that it is smarter and better to prevent disease than to wait for the disease to come and then try to find a cure? It's kind of too late at that point and you will go through needless suffering. Typically, when the average person looks for help with something, they won't look for the answer until they are in desperate need. And at that point, you are in a state of panic and desperation and all hope can feel at a loss. But what if there was a better way? What if you could be prepared for the challenges ahead so that when they come, the answers are already there ready for you to implement with calm and ease? I call it Preventive Self-Help! Over the past 8 years, I'm sure if you combine all of the tangible books, as well as all the articles I've read online, I must have read at least 250-300 books. In just one 250-300 page book, there are approximately 55,000 words. Times that by 250 books and I have deliberately registered about 13,750,000 words into my brain. Out of these 250 books, I've only read about 5 fiction novels and the rest were self help. So that means that 13,475,000 of those words were directly aimed at improving my life. That also means that I have that many words to draw on, to help me in any given situation I find myself in. Self-help books and articles are like nutrition for the mind. It fuels your mind with what it needs to be mentally healthy and prepared for the harsh elements of life. This is why I can deal with most of my issues and setbacks with ease. I have all of these reference points to draw from, to give me new perspective on every situation I face! So instead of waiting for hard times to come before looking for an answer, I simply read as much about life and how to master it as I can everyday, so that when there comes a time (and they show up a lot) that I am faced with a difficult situation, I have the knowledge needed to get through it without going into panic mode. If you haven't yet been exposed to self-help, consider this article the start of that journey. I highly encourage you to take what I've shared here and apply it starting TODAY! It could literally mean life or death! If you're sick of suffering dis-ease (a life of uneasiness) you can take this information and move forward with confidence and prepare yourself, like I do, for the rough times ahead. 1. I just don't know where to start. 2. I feel overwhelmed every time I think about my goal(s). 3. I've hit some walls on the way and have thought of giving up. 4. I would love to reach my goals but I don't believe it's possible for me. 5. I just need help from someone who knows what their doing. Do these questions resonate with you? If yes, you need to schedule a starter session with me today! It's time you get what you've always wanted! You deserve it! Think of everything you've been through! Don't you think it's time YOU get what you want? 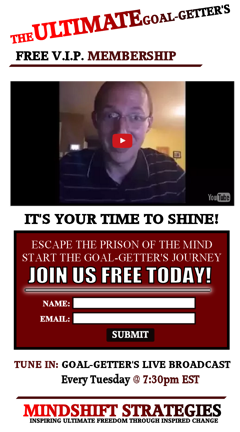 Get our FREE Goal Getting System below and soak up everything you can! Once you are confident that we can help you get what you want, get back with the person who personally shared this with you and we'll start you on the path to living your dreams.